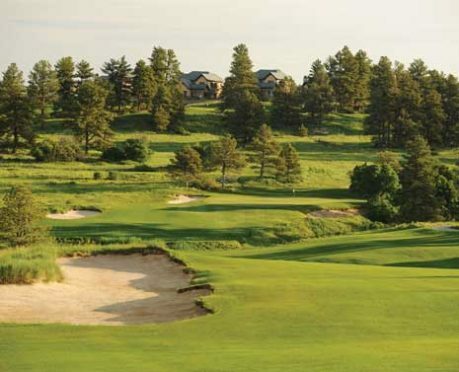 Tour Edge’s pricing for its Exotics EXS line will help you play premium clubs. Tour Edge’s Exotics Skim through an ad or some editorial about Tour Edge’s new EXS Exotics driver and you assume it’s a very shiny, very expensive club you’re reading about. The list of performance-enhancing features is long, and sounds every bit as convincing, not to say enticing, as something one of the game’s biggest manufacturers might produce. But instead of the $500 or thereabouts you’d probably expect to have to pay for such a club, the makers of this one are asking for just $300. Tour Edge has always sought that vacant, largely unoccupied parking lot a story down from the BMWs, Mercedes, and Audis but one, if not two, above inferior makes. However, the Exotics line which first appeared 14 years ago, was created to sell premium clubs at very un-Tour Edge-like prices. It was the company’s Lexus if you like, or Acura. 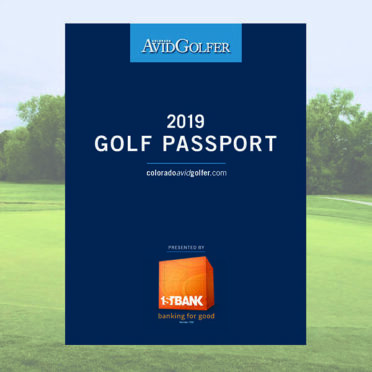 The Batavia, IL-based company founded in a condo garage by David Glod had set out its stall in 1986 as a purveyor of quality equipment at bargain prices – not cheap by any means, just more easily affordable. But Exotics was a whole different side to them (three years ago, we featured a fairway wood called he E8 that retailed for $400. 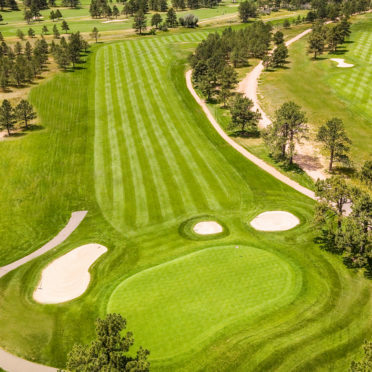 It was a little jarring for Tour Edge loyalists perhaps, but the club sold). So how come the EXS is priced where it is? 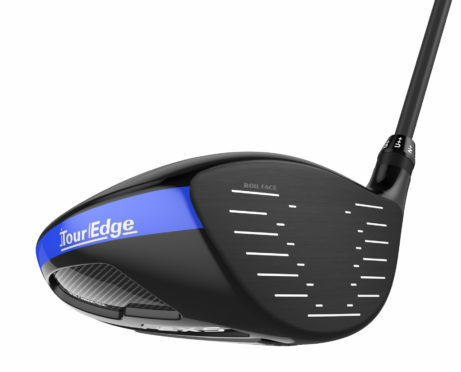 Why is Tour Edge offering so tech-laden a driver at such an attractive price-point? 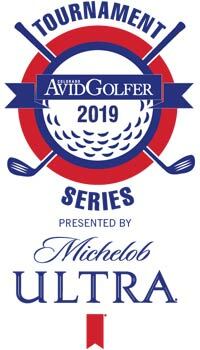 One theory is that they are banking on scooping up mid to high-handicap golfers whom the more prominent OEMs have let go, as it were. That’s not to say the big boys have rejected less-able players entirely of course, just that they are not those companies’ main focus. At this point though, who really cares about the hows and whys? The fact is, you have the opportunity to buy an adjustable, multi-material driver for well below the going rate. The Flight Tuning System consists of 9-gram and 3-gram weights that can be moved to give you the trajectory you’re looking for – 9g in the back for a higher launch and higher MoI, while putting it up front will obviously give you a flatter shot (6, 11, and 14-gram weights are also available). The adjustable hosel allows you to adjust the loft plus or minus two degrees; the RollFace incorporates modified bulge and roll on the toe which creates corrected shots from the toe which is where, Tour Edge says, the majority of driver miss-hits come from. The super thin/strong TSP 910 Beta Titanium face plate, used before in the company’s EX10 driver, features Variable Face Thickness, and is joined to an 8-1-1- titanium chassis with carbon-fiber crown and additional carbon-fiber in the sole whose weight benefits enabled Tour Edge to add the FTS and adjustable hosel. What else? 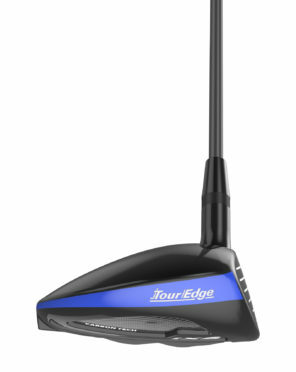 The sloping crown and wider speed channels on the sole improve the clubhead’s aerodynamics, says Tour Edge. 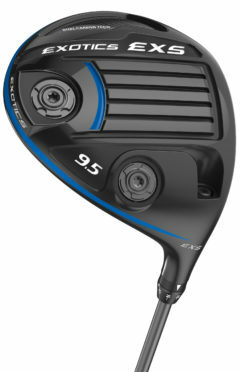 SlipStream, though originally designed to create less friction between hybrids/metal-woods and the turf, is used here to increase clubhead speed; the carbon-fiber in the crown and sole improves acoustics according to the makers; and the Tensei CK Blue 2G shaft series by Mitsubishi Chemical would retail at $140 if sold separately and is about as good as a stock shaft can get. It’s a tidy little package at a seriously good price that you’d be wise to consider. Also available now are the EXS fairway woods and hybrids that possess some exotic metals of their own, as well as FTS and the SlipStream sole. A high-strength Carpenter 460 steel cup face is used for fairway woods which, like their big brother, also carbon-fiber in the toe. The Center of Gravity (CG) is pushed forward a little to decrease spin. 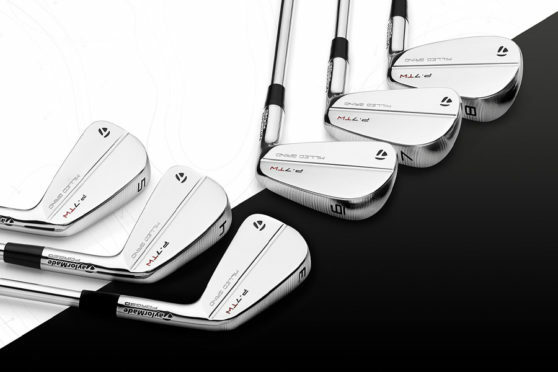 The club face on the hybrids is an HT 980 hyper-strength steel that has been heat-treated to increase strength. The Tensei CK Blue is the stock shaft. The strong-lofted (42° PW! ), hollow-body (undercut on 9-SW) EXS irons feature a forged cup face and, what Tour Edge calls, Spiderweb Technology (a web across the face) which is designed to expand the sweet spot. LaunchPad Technology is a TPE polymer that has been coated with a special gel that is designed to absorb and create more spring effect, while a 19g weight in the toe effectively elongates the sweet spot still further. 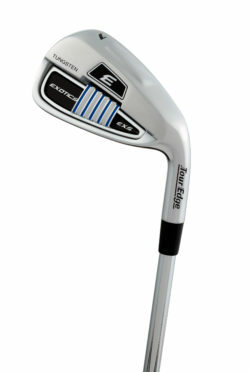 The EXS iron is forged distance club that, like its metal-wood family, is extraordinarily well-paced for the amount of technology it offers. Another Exotics club well worth a look.